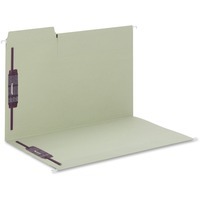 Smead FasTab Hanging Fastener Folder SMD65170 $28.09 The FasTab Hanging Fastener Folder combines the convenience of a hanging folder with the functionality of a fastener folder. Two patented, SafeSHIELD coated fasteners guard against paper tears, finger cuts and excessive fastener crinkling. Built in reinforced tab allows you to write title directly on it. Or you can apply your self adhesive labels. Tabs are 20 percent larger than standard 13 cut tabs so you have plenty of room. Tabs come in assorted positions for easy access to your files. Legal size folders are made of 11 point stock.